Welcome back to another edition of Friday Feels, my new series where I share what I’m “feeling” lately. This week I’m feeling cold! Michigan has definitely made the switch to fall and I have broken out all the sweaters and boots. I’m settling into the routine of being home without the kiddos and one thing I’m loving is actually eating a real lunch. Typically I end up eating peanut butter and jelly crusts, a few carrot sticks, and whatever leftovers my kids don’t finish up from their lunch. But now I have time to eat like a real grown up. 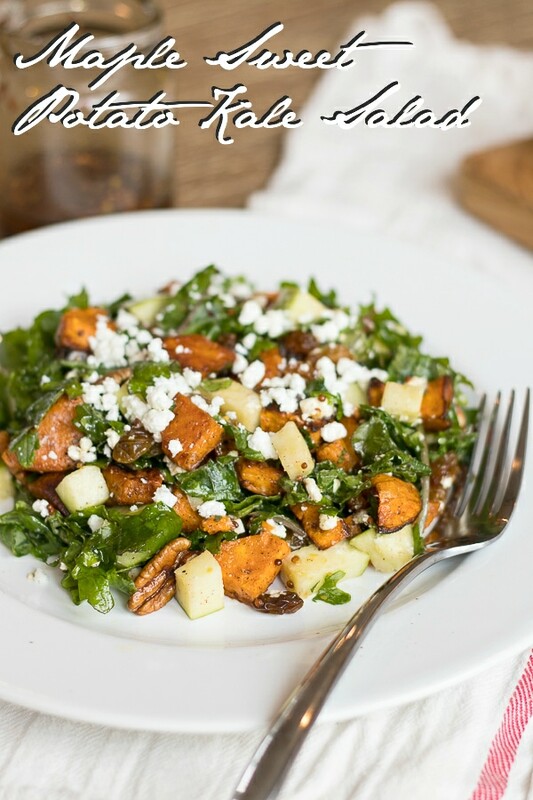 This Maple Sweet Potato Kale Salad has been my go to this week with the fall air outside. It’s so easy to meal prep this and eat it every day for lunch. 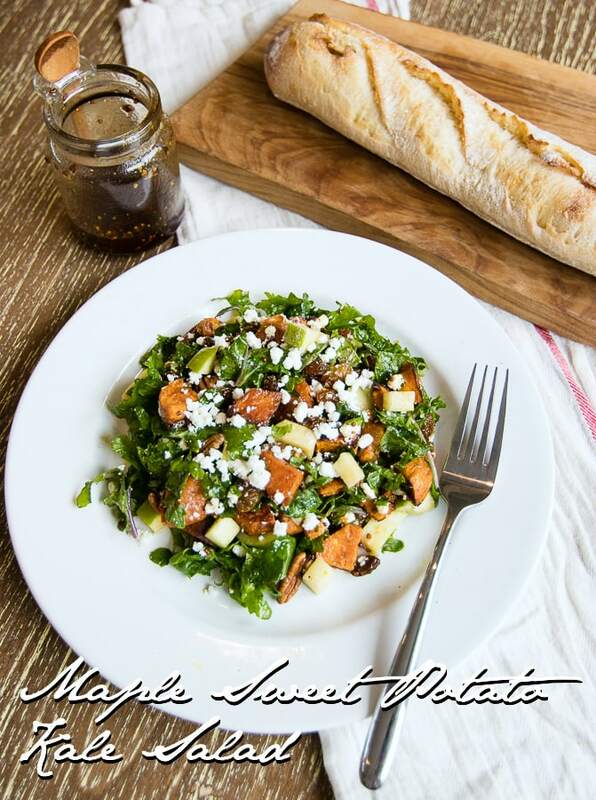 It has cinnamon roasted sweet potatoes, crunchy green apples, pecans, golden raisins and kale. All topped off with a bit of goat cheese and a maple mustard vinaigrette. Peel and chop sweet potatoes and toss in a drizzle of olive oil, cinnamon, salt and pepper. Roast at 400 degrees for 30 minutes. Set aside to cool. Mix all salad dressing ingredients together in a mason jar, shake well. Mix chopped kale, apples, sweet potatoes, pecans, raisins and goat cheese in a bowl. I recommend eating while reading a book in a cozy sweater for maximum enjoyment of your grown up lunch break! Oh yeah glad you liked them Wendy! I’ve been wearing them a ton! What an interesting combo – it looks so good! I’m still in the trenches of babytown, so meal prep and sitting down for a real meal are foreign to me :). If I can get a few minutes though, this looks easy to throw together, so I’m definitely going to try it. Thanks for sharing! I would never have thought to put sweet potatoes in a salad? I’ll have to give it a try as that salad looks AMAZING!!!! I’m so enjoying all your posts about the house. It is just beautiful. The pictures always make me smile because I can just imagine the “feel” of the house. Enjoy every second of the house, and your kids being little. Ours are grown and married and I’d give anything to go back to those days!!! Wish I lived closer, I’d invite myself over for a tour of your house, then a cup of tea and a visit on your back deck overlooking the lake!! We’re not quite to the boots and sweater weather here in Missouri, but it’s coming. Fall is my favorite time of year!! Blessings dear lady!!! Keep the pictures and the posts coming!! Have a great weekend!!! Thanks so much Robbin, we really are enjoying every second in this house :) Thanks for making my day with your sweet comments! Its me… I am so impressed with your new home. I was worried about the former gorgeous flower boxes but you knocked that out of the park too. Love your Friday blog…But. I have not seen the pup!!!! !Did he transition or stay with his grandparents, I am laughing! Yum! And I love the Target tops from last week as well. Love your fashion pics! Thanks! I’ll have more coming soon! I’ve been making this salad almost every day for the last week. It’s so delicious and my kids like it too! Thanks so much for posting. Oh good, I’m so happy you like it! And can you teach my kids to not be so picky?? This salad is amazing. One of my favorite restaurants has this and I could never figure out the recipe. Thank you! !